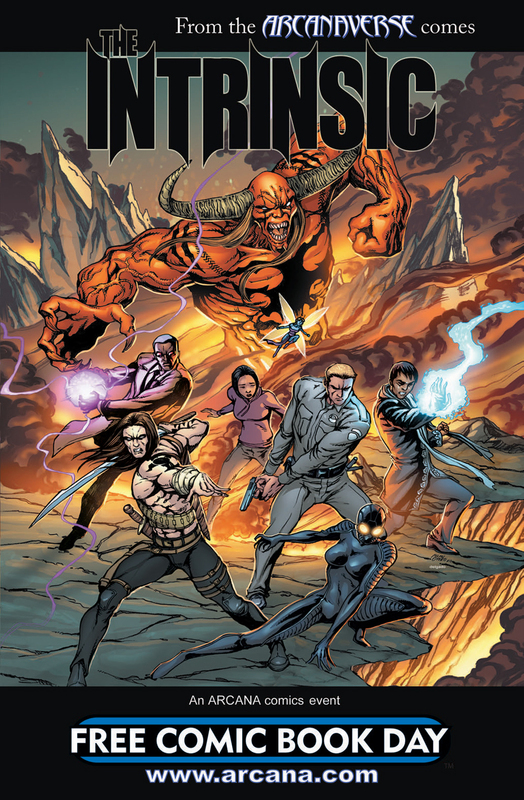 The Fellowship was fortunate enough to obtain a copy of INTRINSIC #1 from Arcana Studios. The story is by Sean Patrick O’Reilly, Casey Jones, and Erik Hendrix with art by Allan Otero. Dr. Ishmael Stone and Blind Jack are assembling a team to deal with the upcoming apocalypse. Apollyon and leads an army through different realities trying to find the love of his life who is missing. If he succeeds, the barriers to the different worlds will fall (not a good thing). Our heroes may have found the final members of the Intrinsic team, but is it too late? And what about Dr. Stone’s visions of him failing the team and the universes at the crucial point of the battle? INTRINSIC is Arcana’s first cross company event, and it has the potential of being one of the better ones in a while. This issue is certainly has substance, not just style and hype. Allan Otero’s art is great; he handles the action and drama with ease. This should be a fun ride and I will be there alongside them. INTRINSIC #1 is in comic book stores as a part of FREE COMIC BOOK DAY this Saturday (May 5). It’s also available at www.arcana.com.